September 30 – October 1, 2, 3 & 4, 1975. VALERIE BINGHAM’S liking for the American humour shone through in her handling of Neil Simon’s The Odd Couple, the first play she has directed for Wick Theatre Company, which played at the Old Barn Hall, last week. She squeezed maximum laughs from a talented cast and the excellent comedy about two divorcees sharing a New York apartment. One immediate question was how would the ‘odd couple’, Felix and Oscar, and their four poker-playing friends manage to sound like Americans. The American accents wavered at the start but by the finish the voices could just have easily have come from MASH or any other American TV series. The Wick actors also seemed well at home with Simon’s clever script. One line that stuck in the memory was when Oscar was asked why he played poker. ‘Because I need the money.’ replied Oscar, a sports writer who boozes away his salary and has a hard job raising his wife’s alimony money. ‘But you always lose, Oscar.’ ‘That’s why I need the money.’ replied the duff card player. Jack Bingham, husband of director Valerie, gave a heart warming performance a Oscar. But possibly the most demanding task fell to Alan Upton who had top portray the neurotic Felix, a hypochondriac obsessed with hygiene and possessing just every hang-up under the sun. The four poker players were Roger Stott, Ralph Warman, David Wiltshire, Peter Joyce, who struck up an instant rapport in their rôles. Then there were the Pigeon sisters who provided Felix and Oscar with much-needed female company. Margaret Ockenden and Helena Drzyzga filled those parts most attractively and kept the humour flowing. A word, too, about the set which was inventively designed by Vincent Joyce. Oscar’s apartment had a particularly authentic air before Felix tidied up which, among other neat touches, a pair of socks dangling on the window ledge. 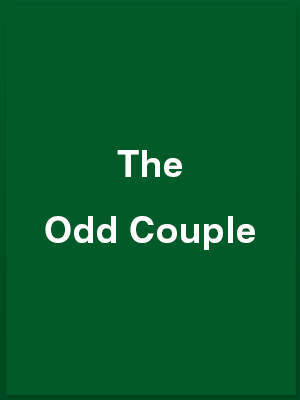 The Odd Couple was produced by Diana Parish and, all in all, was a highly successful choice of play. The opening scene of the Wick Theatre Company’s current production Neil Simon’s The Odd Couple, is an absolute joy to behold – a brilliantly designed set, cluttered with bachelor garbage and heavy with cigar smoke. There is so much attention to visual detail that it seems a shame that the same care wasn’t lavished on the characters at rehearsals. For the play, a brilliantly written American comedy, depends on the speed and delivery of the words for its success. Jack Bingham and Alan Upton play the odd couple, Felix and Oscar, an ill-matched couple of relics of broken marriages driving each other to screaming pitch while sharing a flat. Their interaction is nicely controlled and although some of the comic lines are thrown away many more are saved and savoured. Director Valerie Bingham could have watched the American accents more and she could have tightened up on the exchanges during the poker games. But in many respects it was an excellent production – well cast, well dressed and beautifully set. I liked Roger Stott’s grumpy, cigar-smoking Speed particularly, but it was, of course, Alan Upton who stole the show with his white-faced nervy Felix, an old woman among men. But he was well supported by Jack Bingham as the scruffy Oscar, the four poker players and the twittering Pigeon sisters [Margaret Ockenden and Helena Drzyzga].